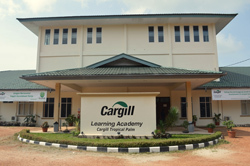 Pictured: The Cargill Tropical Palm Learning Academy, an institute of continuous learning with the objective of developing and nurturing professionals and future Cargill leaders in oil palm management. Indonesia � March 13, 2013 � Cargill recently announced the official launch of the Cargill Tropical Palm Learning Academy, an institute of continuous learning with the objective of developing and nurturing professionals and future Cargill leaders in oil palm management. The academy, located in Manismata, West Kalimantan, is also Cargill's first-ever specialized learning institution of its kind in the world, aimed at training professionals in the palm oil industry. Built at a cost of almost US$600,000, the Cargill Tropical Palm Learning Academy will provide high quality, industry-standard leadership training and technical programs on the sustainable production of palm oil. The institute will also facilitate a Talent Development Program for fresh graduates, as well as employees from Cargill's plantations in Indonesia -- PT Hindoli in South Sumatra and PT Harapan Sawit Lestari in West Kalimantan. The 6400m2 facility currently houses three classrooms, a meeting room, multi-functional hall, library, gallery, prayer room as well as estate and mill training offices. The academy also provides boarding facilities for students from other cities who take up programs at the institute. Through the Cargill Tropical Palm Learning Academy, Cargill will be extending internship and research opportunities in sustainable palm production and management to the students of Institut Pertanian Bogor, following a memorandum of understanding signed in July last year to establish Indonesia's first-ever palm oil teaching farm.